We all know about grinding and it must have ever seen where highly finished surfaces are required. Grinding is a kind of machining process which is done by means of abrasives. 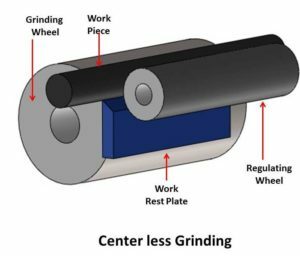 If we talk about centerless grinding then something is cleared by its name that this type of grinding is not have any kind of fixed centre i.e. 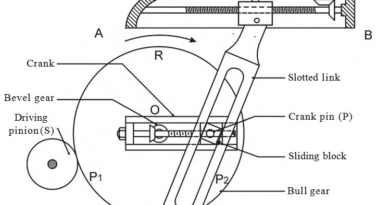 centerless grinding has not any fixture to locate and fix the work piece at a fixed position. It is also a type of machining process which is used to provide a smooth surface to the work piece. In the centre, less grinding the work piece is not provided with a fixed centre or any kind of chuck. The work piece rotates between two rollers; both the wheels rotate in the same direction with different speed. 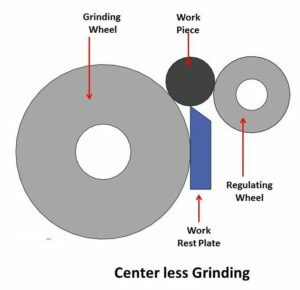 One wheel is known as grinding wheel and the other is known as regulating wheel. The work piece is not provided with any motion attachment and the regulating wheel provides motion to the work piece. Grinding of the work piece is done between both the rotating wheels. 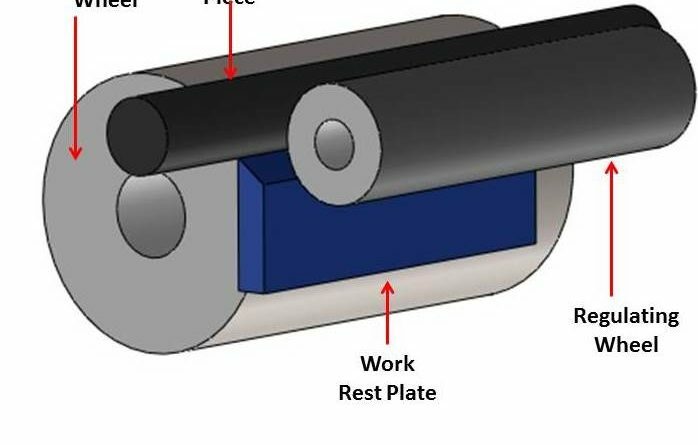 Regulating wheel is rubber bonded and applies a lateral pressure on the work piece to avoid sleeping. The relative velocity between the grinding wheel and the regulating wheel is responsible for the material removal by shearing action. The grinding wheel rotates about a fix axis and has higher angular velocity as compared to the work piece. Only grinding wheel is responsible for the machining, the regulating wheel only applies external pressure for proper grinding; it provides linear feed to the work piece. Regulating wheel is not fixed at their axis, it is moveable so that proper contact should be maintained between the work piece and grinding wheel. The work piece is placed over the fixed work rest plate and the grinding wheel along with the regulating wheel involves the adjustment of the position of a work piece. The centerless grinding can be categories into two type’s i.e. external centre less grinding and internal centreless grinding. We are familiar with the external grinding which is used for the finishing of the outer surface of the work pieces but the internal centre less grinding have some special applications such as grinding of holes for the shafts and other internal finishing operations. The setup of the internal centre less grinding is quite complicated as compared to the external centreless grinding. It has four rotating wheels which are known as pressure roll wheel, support role wheel, regulating wheel and grinding wheel. The grinding wheel is kept inside the work piece as it is an internal grinding operation whereas three wheels rotate outside the work piece. Pressure roll wheel applies uniform pressure from the outside and support wheel support the work piece during grinding operation. The function of the regulating wheel is the same as mentioned above. The main objective of both the types of grinding is the same but the process is different. Both processes have their own applications, advantages and disadvantages. 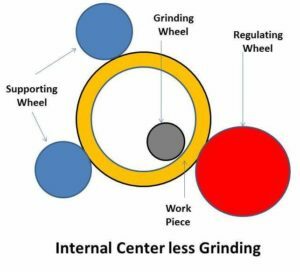 On the basis of working operations following are some differences between the centre and centreless grinding. 1. In centre grinding work piece have fixed centre In the centre, less grinding work pieces do not have any fixed centre position. 2. The work piece is kept between the two centers into the chuck and having the inline axis with the axis of a chuck. The work piece is placed between the two rotating wheels for the machining operations as mention above. 3. The work piece is rotated by means of the headstock of the machine tool but in some cases, the work piece may be stationary only grinding wheel is rotating. In the centre, less grinding the work piece is rotates by means of regulating wheel and the grinding wheel only. 4. The work piece is kept in the fixed jaws that’s why loading and unloading of the work piece is quite complicated and time-consuming process. In this case, the loading and unloading of the work piece are very easy and less time to consume as compared to centre grinding operation due to this setup time is reduced. 5. It is not very economical for mass productions if it is compared with centreless grinding. It is suitable and very economical for mass production. 6. Using centre grinding any shape and size of the work piece can be machined with better accuracy and finishing. With the centre less grinding only cylindrical shape work pieces machined. It cannot machine flat surfaces. This is all about centerless grinding. If you have any query regarding this article, ask by commenting. If you like this article, don’t forget to share it on social networks. Subscribe our website for more informative articles. Thanks for reading it. ← How Hydraulic Brake Works?